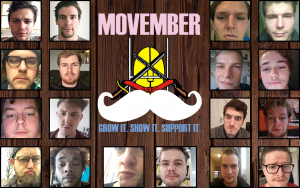 Less than two weeks to go for Movember! The Studs have been busy growing their manly staches and some great results have already come in. Sadly, not all of us can have such a beautiful ‘stache as Dom James, but we’re doing our best! At the end of the month we’ll present the final results, all to raise awareness for men’s health!